Please order early. Allow 4-6 weeks for production unless you pick your own delivery date. When ordering your ring you have two weeks to change metal color or general design of your ring after making the wax model as explained below and the wax is in the oven we will be making the ring. After you place your order a wax model of your ring is created using liquified wax, injected under pressure into the corresponding metal molds that we have on site for every ring we have ever made. The created wax is then trimmed, sized, smoothed and attached to a wax rod with any number of other wax rings of the same metal. After investing the rings in a special plaster mixture (slurry) the wax rod with the attached finished wax rings are placed in a high temperature burnout furnace and over the next six hours in the furnace the wax is eliminated and the plaster is set. Temperatures as high as 600 degrees C are required to properly set the plaster. The plaster cast is ready for metal injection when it cools to 450 C. Corresponding weights of metal are then centrifically spun into the plaster casts and exact duplicates of the wax rings are formed, quenched in water and cleaned of all plaster residue. The newly made tree of rings is now ready for the hours of bench work that is necessary to saw the rings off the tree bring them to their proper size (shrinkage ocurs during plaster investing) make them round, file any excess metal off, and smooth the rings with different grit sandpaper. This prepares the rings for polishing! Polishing each ring is the most important part of finishing the rings. The insides of of three times for each ring. 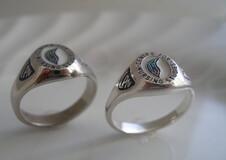 The rings are then ready for colour and engraving. Colouring a ring can takes as many as 7 days depending on how many colours the ring needs. After the colour has set up the rings are engraved on the inside of the ring perfectly centered on the widest part of the band. The rings are then ready for their final polishing and a nice hot cleaning in an ultrasonic cleaning machine. This ensures the color has set perfectly and the engraving on the inside is smooth. Your ring is ready! When you receive your ring you have a full year to return it if there is something wrong with it and I will re-do your ring at no cost or refund 50% of its purchase price. Enamel and shop charges may apply. 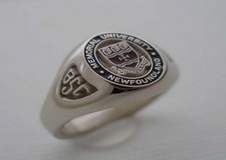 While working for Birks Jeweller in the mid 80's Stephen Vaughan liked the sound of graduation rings made in Newfoundland. 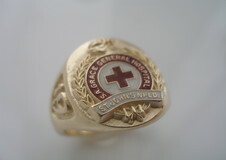 He investigated the methods of manufacturing precision detailed precious metal rings and discovered that in order to make a great ring you needed great molds. 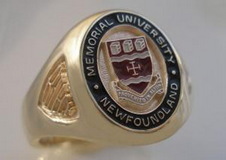 Partnering with a master mold maker in Ontario Stephen went about creating molds for the Memorial University High Schools and professional organizations. 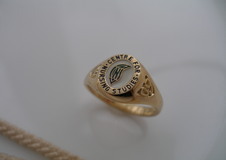 Investing in the necessary equipment to cast rings Stephen through, trial and error, taught himself the art of casting extremely detailed graduation rings. 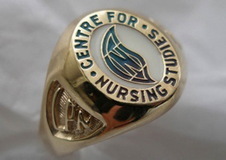 With the advice and help of many people in the industry Stephen is hard at work making his special rings for students and professionals and adds new designs to his collection every year. 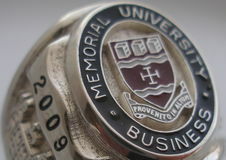 Your Campus Ring is created with the most exacting standards in our industry. 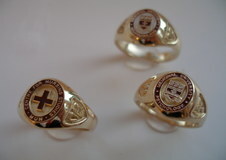 We warrant (every) class ring to be the finest quality and craftsmanship available. 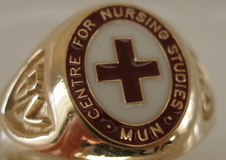 We take pride in saying that your class ring, given reasonable care will last a lifetime. We will always be happy to repair any ring that fails to meet these standards. We do not buy old jewellery or used metal in our production methods 24 karat gold is blended with appropriate alloys. All scrap metal and bench sweeps are sent for refining every month to ensure quality and a uniform product. Our sterling silver is blended with a special de-ox alloy to lessen the chance of oxydation.